University of Washington Staff Mar 30, 2019. Once the surge of water reached a river mouth, it transformed into a 30-foot wall of water, tossing hundreds if not thousands of freshwater fish — sturgeon and paddlefish — onto a sandbar and temporarily reversing the flow of the river. 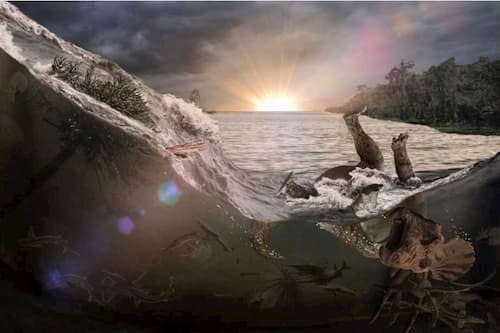 This unique fossilized graveyard – fish stacked one atop another mixed with burned tree trunks and conifer branches, dead mammals, a pterosaur egg, a mosasaur and insects, the carcass of a Triceratops and seaweed and marine snails called ammonites – was unearthed over the past six years in the Hell Creek Formation in North Dakota by lead author Robert DePalma. Adapted from a UC Berkeley press release.